You might be aware by now that Bucharest, the capital of Romania, is a very exciting destination to travel to. It’s a great city, with a rich history that you will see in the old buildings but also cool places for modern entertainment. And, last but not least, some excellent prices for practically everything! There are many things to do and discover in this fun and eclectic city, where the old meets the new, creating interesting juxtapositions in more than architecture. If you’re preparing for a spontaneous trip to Romania, or a city break to its capital city, read this article and discover wonderful places to visit in Bucharest! Bucharest is the 10th largest city by population, in the European Union. According to estimates done by specialists, three million people are living and/or transiting Bucharest everyday, and it is expected that, in the next five years, this number will exceed four million people. The city has six sectors, the first and the third being the most central and appealing for its important museums, nightlife, restaurants, hotels and casinos, and other places to visit in Bucharest. The Old City center is located in the third sector, and it is the most lively area in the city, not to mention the most inspired location for a tourist accommodation. Pubs, cafes, restaurants and shops are right next to each other, making it a fun leisure destination for many. In this busy and lively area, find the perfect accommodation at a posh hotel. After you are settled in your room, it’s time to start exploring the city! Start your day with a walk around the Old City and discover an eclectic building, the CEC Palace. 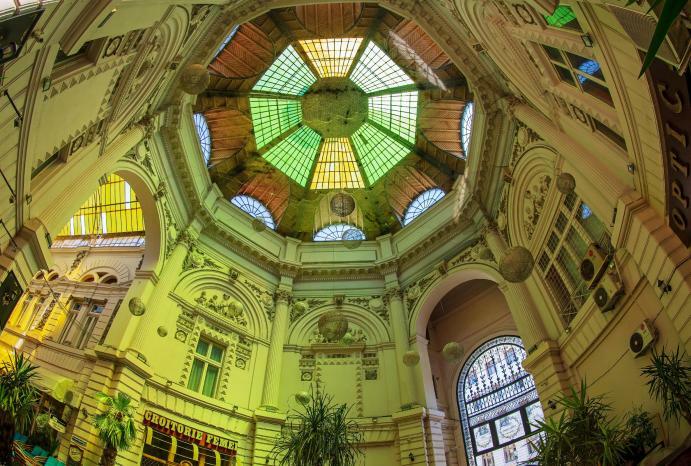 Built in 1900, it is a heritage site and one of the places to visit in Bucharest that you should not miss! The National Bank of Romania, known as the Old BNR Palace, can be admired right at the entrance in the Old town. Built in eclectic style, the building is located near Lipscani, Calea Victoriei, Smârdan and Doamnei street. Enjoy lunch or dinner at Caru’ cu Bere (The Beer Wagon), a gothic revival building built in 1899. The art nouveau interior decorations has made Caru’ cu Bere an architectural gem, and one of the most beautiful restaurants to dine in. The food, of course, is excellent, and has some Romanian specialities worth tasting. A few steps away from the restaurant - and we mean that literally - you can admire the Stavropoleos Monastery, an Eastern Orthodox monastery for nuns built in Brâncovenesc style. One of the monastery's constant interests is Byzantine music, expressed through its choir and the largest collection of Byzantine music books in Romania. End your day with a drink at a swanky rooftop bar. If you wish to see the Old City from above, close to the CEC Palace you can have drinks at Linea/Closer to the Moon skybar. This place is just 1 year old, making it a still very popular and trendy place to have drinks. After a healthy breakfast at grand cafe Van Gogh, right next to the old BNR Palace, why don’t you do a tour of some of the most interesting buildings in the city? A few minutes away from the Old City area, the second largest administrative building in the world (after the Pentagon), the Palace of Parliament can be seen in all its glory. It has 365,000 square metres. You can visit the interior of the building too! On its right side you will find the National Museum of Contemporary Art (MNAC for short). But there are also some other architectural gems that you can discover over the course of one day. Cercul Militar Național (the National Military Circle) is just a few steps away from Universul, and it is worth checking out for its art galleries. In this impressive building you will find a restaurant, so you can make plans to enjoy a meal here later. A bit farther away from the area, in Revoluției Square, the old and new combine into a mixture of brick and glass, creating an unusual building which today is the HQ of the Union of the Architects. The glass parallelepiped is erected from a ruin of architectural and historical value. It surely is a sight to see! Close by, you can visit the National Art Museum, and the Athenaeum - a landmark in the city, as it is an impressive concert hall with spectacular architecture. Find a bench to rest on in the small garden right in front of the Athenaeum. After that, check out Pasajul Macca-Vilacrosse, a fork-shaped, yellow glass covered arcaded street on your way back to the Old City center. Cafes are all around, and here you can enjoy a nice, flavoured hookah. You can also take a organized photowalking tour, that will take you on a trip to discover Bucharest’s -not-so-known places. Ask at reception for recommendations! If you’re feeling a bit tired after all that walking around, then it’s time to enjoy a relaxing day, at Therme București. Therme is an incredible oasis located North of Bucharest. Here, you can relax in various pools with thermal water, enjoy cocktails in the jacuzzi and lounge under your own palm tree. Definitely one of the best places to visit in Bucharest, so don’t forget to bring your swimsuit! Recharge your batteries and head back to the city, on the oldest paved street in Bucharest - the French Street - where you will discover a fully refurbished 19th century building, the home of Concorde Old Bucharest Hotel. Concorde Old Bucharest Hotel is a comfortable and convenient accommodation space, perfect for those of you who are visiting the city. 38 stylish and spacious rooms offer ultra-modern comfort, and, in spite of being right in the middle of the urban fuss, at Concorde you will find tranquility. Tourists who come to explore places to visit in Bucharest should book now , as the attractive accommodation can get pretty busy! We hope you will enjoy your stay in Bucharest with us, at Concorde Old Bucharest Hotel, and come back some other time too!